Sam Irl is a talented producer from Vienna to keep an eye on. After a few releases on various labels, amongst others a 7" collaboration with Dorian Concept and a featuring on "Kutmah presents Worldwide Family Vol. 2" (Brownswood Rec.) with Ritornell, he is releasing his new EP on Jazz & Milk. The "Slower Bavarian EP" begins with "Safety Hertz", a moody deep house tune with live rhodes and analogue synthesizer chord movements building up a melancholic yet forward-driven vibe. The bass-heavy broken-latin "Batuque" started out as a sponanteous summer jam with Dusty on a visit to Vienna which has already been played out and supported by DJ's like Mr. Scruff. The B-side begins with "Oh Mother", a raw percussive afrobeat workout with an ethio-sytle twist, recorded together with Viennese underground group "Smizuler & The Helmets". Additional Trumpets were played by LA's Todd Simon. The EP concludes with an excellent remix by Sam Irl homie "Cid Rim" remixing "Safety Hertz", turning it into a futuristic and dreamy bass workout. 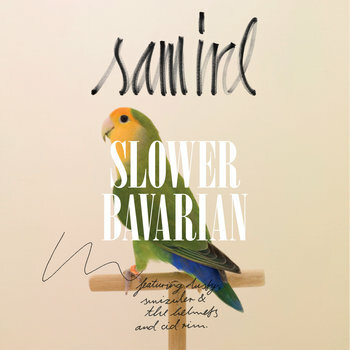 Sam Irl, a young producer originally hailing from a small village in rural Lower Bavaria, has been living and working in Vienna for quite some time now. Besides studying recording engineering at Vienna's University of Music and Performing Arts he produces tracks of various styles, ranging from sample-heavy MPC Hip Hop beats, analogue tape-recorded synthesizer Funk to raw Broken Beat and Deep House tunes. He has released on Stuttgart's Pulver Records, Bonzzaj Recordings ("Untitled One" with Dorian Concept) in Switzerland and Fresh Minute Music London. Besides releasing his own music he has done remixes for JSBL, Swede:art, Trishes (FM4), Inverse Cinematics (aka Motor City Drum Ensemble) and Munich's dialect-Hip Hop-group Doppel D.
Look out for Sam Irl's live performances jamming on two MPC's, drum computers and analogue synthesizers.